Note: The file size of this map is extremely large (1.79 GB). From the makers of Audia City, We bring you, Oshode. 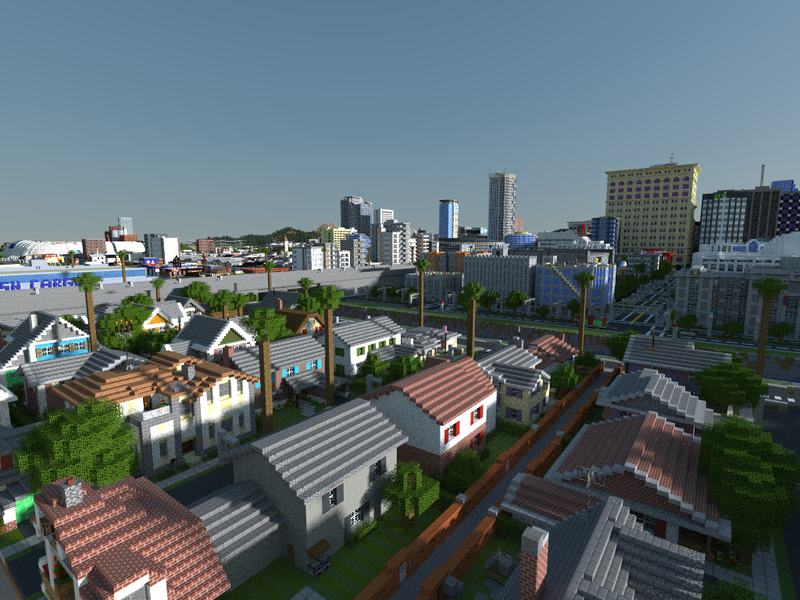 With over 4,000 total buildings, and 96 square kilometers of land, Oshode city is officially the biggest Minecraft city ever made, along with being one of the biggest Minecraft maps in general. Two years in the making, and with the help of over 100 dedicated people, it is now available for download! Explore countless buildings and beaches. Or go for a hike in the national forest. Or try your luck with infiltrating Area 51. There are endless possibilities. Six airports, three theme parks, three islands, 946 houses, 20+ boats and ships, and much more! Oshode is a 1:14 scale recreation of Southern California. (With some added detail). +52 StrongRuler I'm scared to load this ._. +13 Anna hey dude, I love your map! But, I only needed the school and the little houses on the side. It's a great map and I know it took you more than 6 months to build it. You should probably make another map. +5 xKaiChanx This looks awesome! I might try to download it.. Though that's large file size. Still awesome. +1 KEN UNBELIEVABLE!!! NEARLY 2GB MAP!!!! +4 sirmeliodas I loved audia city and this one too 1mil stars from me. -11 Niko will this not work on minecraft version 1.7.10? +4 Ryan This maps is very Big and cool! +4 Lonewolf This map really helped about where me and 100 friends where gonna role-play! it was really awesome dude,keep up the awesome work! (oh,i also think that maybe you should copy this world but in a post-apocalypti c scene, like in a zombie apocalypse or aliens taking over the world!i hope you like my idea, if you don't well im still happy to give you this idea! and if it was a zombie apocalypse, then area 51 should be the safe house or the safest place,(which is according to me)so anyways, i ope you still do stuff like this bro! it really is awesome, and 5 stars from me and a round of applause! *clapping with friends * i just blocked some areas where no one was living except for area 51 so bye!!! 0 Cloudie Does it have a school and is everything furnished? +1 mutrax Hi, still importing, but is there a reason that there are two saved folders in the zip? 0 Den AWESOME! i'm still downloading it and i'm predicting it to be SOOOO! AWESOME!!!!!!! +2 bluspacedude Great map to admire and blow up when ur bored. Love it. -3 mindbender0007 Its an amazing map, the city is very detailed and by all means large. But its no where near the largest city, Al Naemani Emirates is about twice as bigand the largest Minecraft city is actually the world of Keralis server. -3 busterdogtnt does it have a military base?